If you were watching last night's episode of Veep on HBO, then you surely noticed that Gastonia played a large role in the comedy starring Julia Louis-Dreyfus. 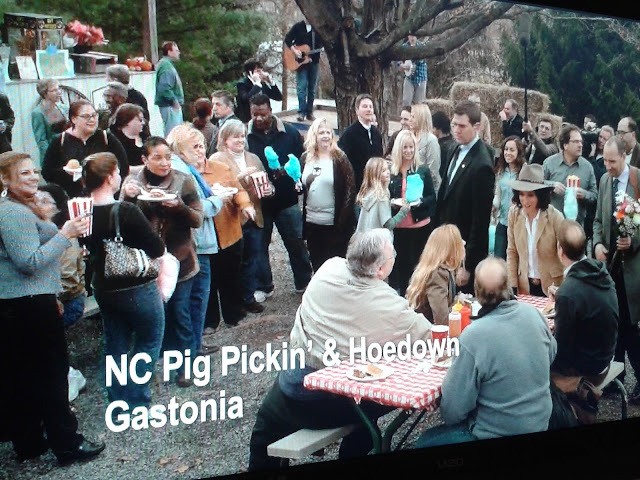 It was episode 10 of the show (season two, episode two), and Julia's character, Selina Meyer, the first female vice president of the United States, received orders from POTUS to attend a North Carolina pig-pickin' as part of their new Listen to Rural America Program, "U.S. Hey!" The pig-pickin' was in Gastonia. Around these parts, we love for our cities and towns to get TV time, even if in fictional shows (Showtime's Homeland and Cinemax's Banshee, for example), but I'm not sure how Gastonian's feel about their portrayal in Veep. In one scene, while aboard Air Force Two on her way to Gastonia, the fictional vice president says she doesn't want to get "stuck talking pig sh*t with people who use hay as furniture." You had to laugh at that. Another portrayal the show embarks on is the long-running, heated debate on North Carolina barbecue, by choosing a pig roast in Gastonia to attend. N.C. BBQ got thrust into the national spotlight when the real First Lady of the United States, Michelle Obama, announced that Charlotte had been awarded the 2012 Democratic National Convention, saying that: "Charlotte is a city marked by its southern charm, warm hospitality, and an "up by the bootstraps" mentality that has propelled the city forward as one of the fastest-growing in the South. Vibrant, diverse, and full of opportunity, the Queen City is home to innovative, hardworking folks with big hearts and open minds. And of course, great barbecue." I wrote extensively about the DNC for a year, so I saw how often N.C. barbecue was brought into political circles and conversations. Veep does a good job of mimicking things politicians actually do, but with more of a hilarious exaggeration. Like, politicians really do go campaigning at North Carolina barbecue events: read my past DNC blog post, which includes a recap of the annual Mallard Creek Barbecue; and last June I begged national media to stop talking about N.C. BBQ; and even more fitting, in October 2010, a New York Times reporter visited a Pig Pickin’ and Politickin’ rally in Huntersville, hosted by a Republican women’s club. At a recent Levine Museum of the New South event, the Uptown museum featured an Eastern vs. Western North Carolina barbecue tasting and competition. We take our barbecue seriously around here. Veep got that much right. Veep got ALL of it right Hilarious.